At the end of the 19th century, after the American Civil War, racial segregation was imposed in the United States. Black people were then illegally mistreated. Just by a simple act of sitting down in a bus Rosa Parks has changed the world! 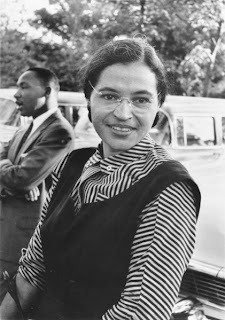 Rosa Parks was born Rosa Louise McCauley on February 4, 1913 in Tuskegee, Alabama. Her father, James McCauley, was a carpenter, and her mother, Leona Edwards, a teacher. She was of African-American origin. At the age of 11 she entered the Montgomery Industrial School for Girls which was founded and led by white liberal-minded women for black children. The school's philosophy of self-worth was encouraged by her mother who used to tell Rosa to “take advantage of the opportunities, no matter how few they were”. On December 1, 1955 Rosa Parks who was then a volunteer secretary of the NAACP (National Association for the Advancement of Coloured People), refused to give up her seat on a bus to a white passenger and was arrested. This is considered by most historians as the beginning of the modern civil rights movement in the United States. At that time, in Montgomery, the first four rows of seats on a bus were reserved for white people. Buses had “coloured” sections for black people, generally in the rear of the bus. Rosa Parks was on one of those reserved seats but because there were not any seats left for white people, the bus driver, James F. Blake, asked four coloured passengers to give them their seats. Her action was at the origin of the bus boycott in Montgomery. The black community decided to organise this boycott as a protest against segregated seating on public transport in the city. The black community then elected the well-known Martin Luther King as leader of this movement. This boycott was extraordinarily successful. Blacks hitch-hiked, formed car pools or simply walked instead of taking public transport. They achieved victory on 20 December 1956 when segregated transportation was recognized as unconstitutional. Some years earlier, a certain Claudette Colvin, a 15-year-old girl, had been arrested for the same reason. But because she was pregnant, she was considered unsuitable to be the symbol of the Civil Rights Movement. Late in life, Rosa Parks was rewarded for her acts and amongst others received the Martin Luther King Jr. Award. Her highest one was the Spingarn Medal from the NAACP. In 1999, the US Senate described her as “ a living icon for freedom in America.” At her death, on October 24, 2005 (at the age of 92), her casket was transported to Washington D.C. on a similar bus to the one in which she made her protest. There she lay in the U.S. Capitol Rotunda. She was thus the first woman ever to receive this honour. Thanks to her, the current living conditions of the black people in America have greatly improved.